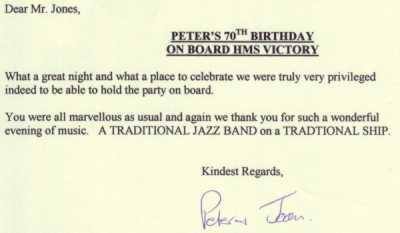 Jazz band for party entertainment ideas, live music for parties, UK. A jazz band to play live music for your party is a good entertainment idea. Hampshire, Dorset, Sussex, Surrey, Wiltshire and Berkshire in Southern England, UK. 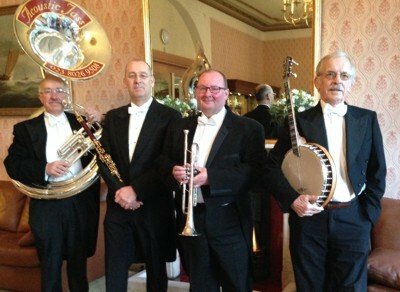 Acoustic Jass is a traditional jazz band for hire for parties that play a mixture of well known classic jazz standards and popular music of the early 20th century for your party entertainment. 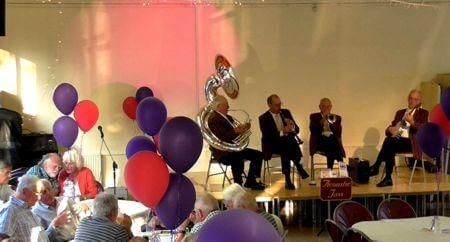 Acoustic Jass is an execcent band for private functions as they are a truly acoustic jazz band although they can use amplification for singing and chat. This band has the advantage are that they don't need a lot of space, they are mobile and pay attention to the volume level. 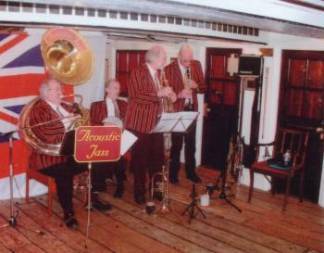 Acoustic Jass has a new CD for Sale, recorded at various events, if you didn't hear this jazz band at these parties or weddings you can buy the CD to hear how good it was. 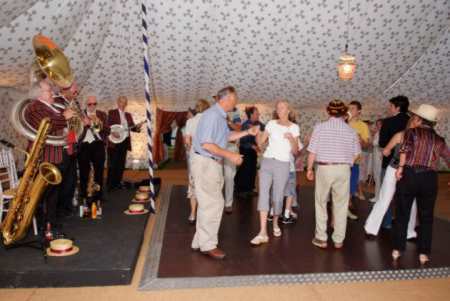 A private function with the guests danceing to the jazz band. Contact this jazz band for your party music. Acoustic Jass tailor the choice of their good quality music according to the client's wishes. 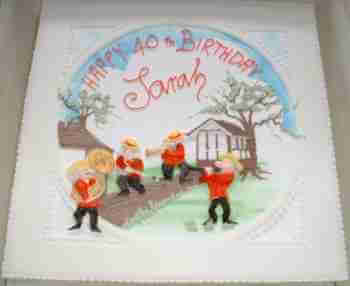 If you want background music during a meal or exciting foot tapping dancing music for a party this band can provide it. 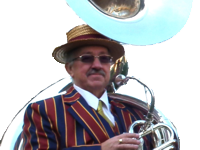 Acoustic Jass with their polished professional performance tailored to the bookers requirements, are available to help your private parties go with a swing and make them extra special. In addition to their nineteen twenties style striped blazers Acoustic Jass have evening dress tailcoats for the formal twenties white tie and tails theme. This jazz band at a birthday party at Horsebridge Station. They are the icing on the cake! Acoustic Jass has many tunes on their party entertainment playlist, mainly from the 1900's, to 1940's Great American Songbook, including "All of Me", "Creole Love Call", "Avalon", "Blueberry hill", "Bye Bye Blackbird" and "Tuxedo Junction". Most of these were recorded by Louis Armstrong, Duke Ellington, Frank Sinatra or Bing Crosby, don't expect Acoustic Jass to be a cover or tribute band, they play all the tunes in their own unique style. Samples of a few of their tunes, are presented here in glorious mono!!! If you can't download these tunes Visit our Tunes Page where there are links to video of most of our repertoire. 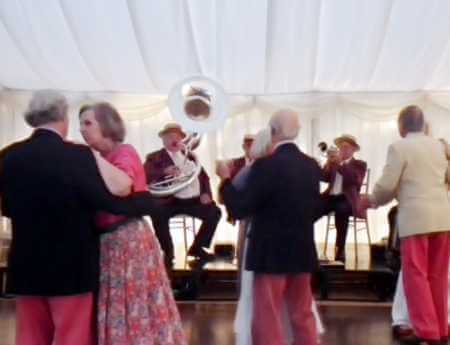 To help you with your party entertainment ideas if you would like these professional musicians to play a special tune, that isn't in their repertoire, they will learn it for you (provided it fits their style!) and, unusually for jazz bands they have some waltz's in their repertoire. or if you want to book us go there to see if we are available.